Hide a drab wall with this funky trellising for plants to climb up. You will need: A 1.8m x 1.8m trellis panel, 7.2m fence capping, 75mm brass screws, paint brush, paint tray/roller, mitre box, handsaw, skilsaw, drill and screwdriver. 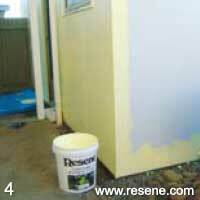 Resene Paint Prep and House Wash, Resene Concrete primer and Resene Quick Dry Acrylic Primer Undercoat. Resene Lumbersider in Resene Pale Prim and Resene Black Forest. 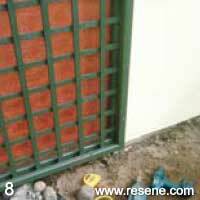 Resene Sandtex in Resene El Salva. 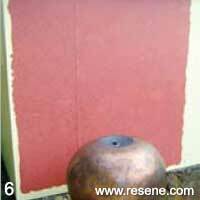 Resene Enamacryl Metallic in Resene Copper Fire, Resene Concrete Clear. 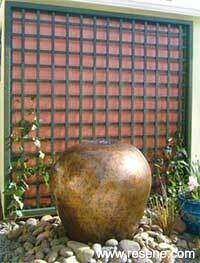 To get the look: we planted hardenbergia either side of the trellis panel. Ceramic Water Work is by Rick Rudd www.rickrudd.com. 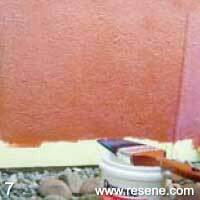 Wash garage walls with Resene Paint Prep and Housewash and paint with one coat of Resene Concrete Primer. Allow to dry. The fibrolite walls of this garage are quite new. 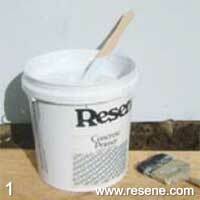 For older concrete surfaces, contact Resene for advice. 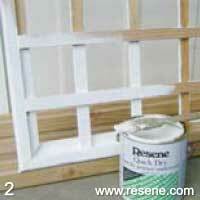 Paint the trellis panel and fence capping with one coat of Resene Quick Dry Acrylic Primer Undercoat. Allow to dry. Paint the trellis and fence capping with two coats of Resene Black Forest allowing two hours to dry between coats. Paint the garage walls with two coats of Resene Pale Prim leaving a 1.75m square where the trellis will be attached. Using the mitre box, handsaw and set square, create a 1.8m square frame from the fence capping, as shown. 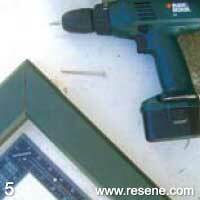 Secure at each corner with brass screws. Using a large brush and 'stippling' technique, apply a generous coat of Resene Sandtex in Resene El Salva, covering the 1.75m square. Allow to dry. 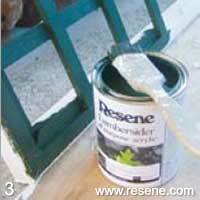 Using a paint roller, apply two coats of Resene Enamacryl in Resene Copper Fire to the 1.75m square. Allow to dry and finish off with one coat of Resene Concrete Clear. Using a drill, screwdriver and copper screws, attach the 1.8m square capping frame to the garage wall, and screw the trellis panel to the square capping frame.